Photo from the Cleveland Press Collection, used courtesy of the Cleveland Memory Project. Last week, I shared this photograph, of a structure said to be Cleveland's Oldest House. The caption noted that it was located at West 93rd and Lorain - but I couldn't find anything in the historic maps of that area that matched up with the footprint of the house. I offered a signed copy of Hidden History of Cleveland, for anyone who could identify the location of the structure or whose house it actually was. 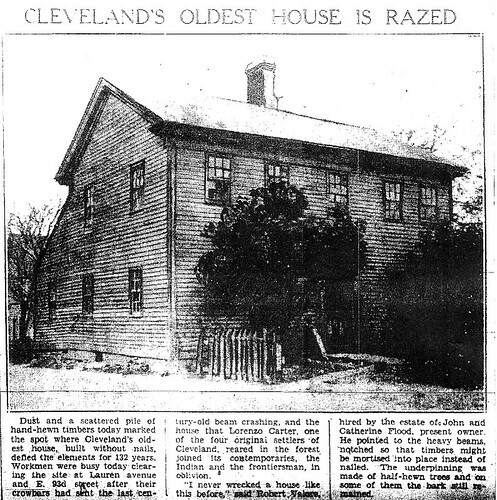 I decided to "look up" whatever I could regarding the alleged Lorenzo Carter house, demolished in 1932, by looking in the Press, circa September 15, 1932. I did succeed in finding what was needed, published, by the way, in that very same date's edition. Detail, 1913 Sanborn map. Used courtesy of Cleveland Public Library. Loren is the street running left-right near the bottom of the image. Our house is at the corner of Loren and East 93rd, the street running top to bottom. This house was neither at West 93rd nor Lorain; it was at East 93rd and Loren. This would be a small number of blocks north of Harvard, just outside of the original Newburgh Village. The article misidentifies the side-street as 'Lauren'. Its exact address was 3890 East 93rd -- it was on the northwest corner. 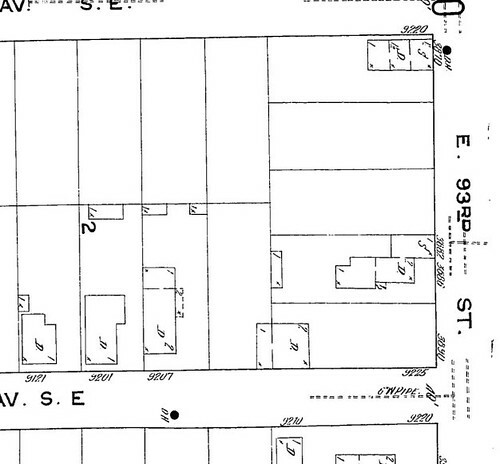 You could see, from looking at the 1913 Sanborn map, that the house was set back considerably from the street. It has such a setback on both the 1881 and 1858 maps. 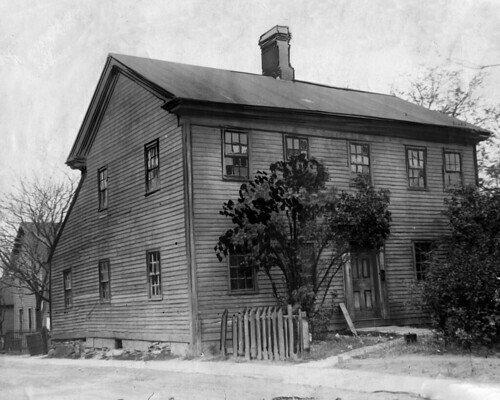 The house behind it in the 1932 photo was the first house on the north side of Loren. I checked the 1881 City Of Cleveland Atlas and the 1858 Cuyahoga County Map. This house was on the property of Alonzo Carter, not Lorenzo Carter. I also looked at various historic Censuses and found an Alonzo Carter in Newburgh as far back as 1850. Both the 1840 and 1830 censuses have an Alonzo Carter living in Brooklyn, not Newburgh. I personally believe that they are all the same person. Those older censuses only listed age-groups, but, considering this, they seem to be about the same person, with knowing that the 1850 census has his age as being 60. 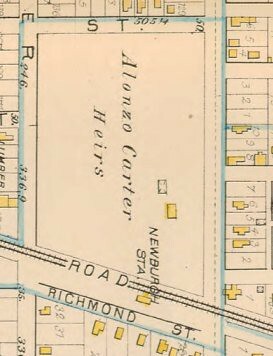 Assuming from all of this that Alonzo Carter moved from Brooklyn to Newburgh sometime between 1840 and 1850, I think that it could be legitimately suggested that the house was built by him whenever that was that he arrived there in Newburgh. If not, then he acquired an already-built house. Regardless of the story of the alleged "primitive" construction features made visible during demolition, I still can not accept that this house was built in 1800 -- at least not the house as we see it in the photo. Could it have been a log cabin extensively remodeled in later years? We will never know. The Dictionary Of Cleveland Biography article on Lorenzo Carter says that he had a son named Alonzo. I am willing to believe that this is that person. The Dictionary says Lorenzo was at least born in Connecticut, while the 1850 census says that Alonzo was born in Vermont. Lorenzo could have moved from Connecticut to Vermont -- they are quite near each other. The 1850 census also says that Alonzo Carter had a son named 'Lorain'. I believe that this is a misspelling; I bet his name was Loren (likely a 'diminutive' of Lorenzo). This should 'explain' why the side-street was named Loren. And, according to the Cleveland Necrology File, Alonzo Carter died in 1872 (quite possibly in this very house) at the ripe old age of 82. He was kind enough to provide a copy of the article as well. 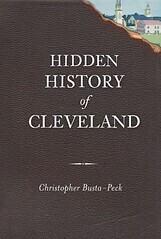 For his efforts, Craig Bobby will receive a signed copy of Hidden History of Cleveland. While we now have the correct location for the photo, we are left with more answers than questions. Perhaps someone else, at some future date, will take interest in this and see what else can be learned about the history of this historic home. Good work, Craig! The photo is misidentified in Cleveland Memory, I see this morning, as the verso of the print clearly says "Alonzo Carter" and the streets are listed as "Lauren" and "East 93rd." There is a minor correction to "Alonzo" with "Lorenzo" on the verso, which may explain that part of the problem, but I apologize for our putting Lorain instead of Lauren and 93rd without the "East" addition. Things would have been much simpler if we'd identified it properly in the first place. So Craig's research and conclusions are mostly born out by the photo, the Lauren/Loren part being someone else's interpretation. The house, now demolished at 3890 E. 93rd, is a significant subject. Questions remain as to the builder and the build date. Some answers may be found in tracing the title transactions for Cleveland 100-acre lot 456, in which the house sat. Land transactions will be as important as census schedules for understanding the age of this house and Alonzo Carters relationship to it. The 1852 Blackmore Cuyahoga County Map has A. Carter owning 56 acres in the northern part of the lot. The Blackmore map often indicates the first individual owners in these lots—those owning significantly before 1852. Alonzo had half the lot in 1852. He may have bought it significantly earlier than 1852. Maybe not. The E. 93rd house has two complete stories, a full complement of windows, and stylish eave moldings and doorway ornamentation. Nevertheless, while the house looks large in the photo, its individual features suggest a diminutive scale of building. For example, the windows are small and the moldings are narrow. It is as if the house was scaled to fit the small size of available resources. The approach is typical of trying to reproduce New England on the frontier before large glass panes were available and Greek Revival fashions arrived (1830s). There are three houses that help put the E. 93rd St house in perspective. Like the E. 93rd house, the Hitchcock house is a New England “large” house built on a diminutive scale. The E. 93rd house ornamentation, a kind of vernacular Federal, resembles the case house. Both houses have narrow decorative moldings in the Federal tradition. On Sept. 23, 2009, Christopher posted a photo of an unknown house in the Newburg area. With its eaves down upon the window lentils, this is an old style New England “cape.” The configuration did not lend itself to late Federal/early Greek Revival cues, and so is rarely seen in the Western Reserve. I’ll speculate that the Newburg cape was built in the 1810s or 1820s. In basic plan (footprint), the E. 93rd house resembles the Newburg cape. The Project of YOUR Dreams?